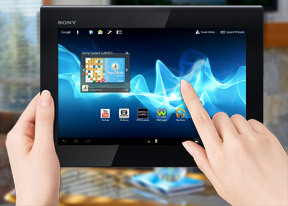 The Sony Xperia Tablet S comes in two versions - Wi-Fi only and 3G+Wi-Fi. The 3G-enabled version comes with quad-band 2G mobile data support (no voice connectivity) and quad-band, HSPA+ enabled 3G. Both versions have Wi-Fi a/b/g/n, meaning they will work on both 2.4GHz and 5GHz networks. The transfer speed is rated at up to 150Mbps either way (you'll need a 802.11n network to get those speeds). Even if you get a Tablet S without 3G, you can still use mobile Internet, provided you have a data plan on your droid phone and the Xperia Link installed. The app simplifies the tethering process. It puts a widget on the homescreen that lets you turn tethering on and off. You might be thinking that you can just use your droid's Wi-Fi hotspot feature to do the same (and you could). The difference here is that Xperia Link uses Bluetooth to share the Internet connection and not Wi-Fi. This should be more power efficient than a Wi-Fi hotspot especially considering you can keep Bluetooth on all the time, which will let tablet and phone hook up automatically once they are close enough (can't do that with a hotspot or your battery will be dead in a couple of hours). The Xperia Tablet S also comes with Bluetooth 3.0 and a built-in GPS receiver with A-GPS. For wired connectivity, it has a standard 3.5mm audio jack on its right and a multi-port at the bottom, which handles charging, data connections with a computer and HDMI TV Out. One feature that we rarely find on mobile gadgets these days is the IR port on top. It's used to control digital appliances like TV sets, DVD and Blu-ray players, cable boxes and so on (and not to transfer data like in the olden days). The port comes complete with a Remote control app, which can handle multiple devices. Adding a new one is quick - you pick the type of device and the maker and the Tablet S will handle the rest. If your device is not on the list, you can teach the tablet its controls by pointing the remote at it and pressing the buttons. The Remote control app is available as both a Small app and as a full-screen app, which offers more functionality. The Small app shows how Sony imagines people will use the tablet - watching TV, while browsing on the tablet (the so called "second screen viewing" is on the rise) and you can always change the channel, adjust the volume or do more. "More" comes in the form of macros - a list of actions that can trigger complex operations. You can, for example, switch the TV input mode to HDMI input and hit play, all with a single button press. When you create a macro, the tablet will make you go through each step so that it can time how long it takes the other device to react to each command (e.g. how long does switching between HDMI inputs take). The web browser is one of Android's strong suits and the Xperia Tablet S comes with both the default Browser app and Chrome for Android. The default Browser displays tabs on top of the screen, just like a desktop browser. You can open incognito tabs as well as set the browser to request desktop sites. One trick that Sony has taught this browser is the ability to switch to the Small app so that you can keep the page you've open on screen while you use another app. You can only have one tab open in the Small app version (the current tab gets pulled from the big browser and moved into the small app). Other features of the browser that we like are the Save for offline reading option and Quick controls. Quick controls offer a circular menu that's very easy to use with your thumb and on a tablet they display a total of 8 buttons (up from 4 on phones). Quick controls also hide the tabs at the top of the screen and leave more room for the page. The browsing speed is excellent and while the screen is comfortably big, we wish it had higher resolution as WXGA on a 9.4" screen doesn't quite cut it any more. Flash comes preinstalled and the Tegra 3 chipset handles YouTube videos at 1080p easily. Games are no problem either. Chrome is also pre-installed on the Sony Xperia Tablet S. It has an almost identical-looking tabbed interface and it shares some of the features of the default browser, like Incognito mode and Request desktop site. The trade-off here is that while Chrome is faster and has better support for new web technologies, it doesn't support Flash or Quick controls (we really like those). What it does have over the other browser is tab syncing with the desktop Chrome browser. This means you can seamlessly switch from browsing on a computer to browsing on the Xperia Tablet S.